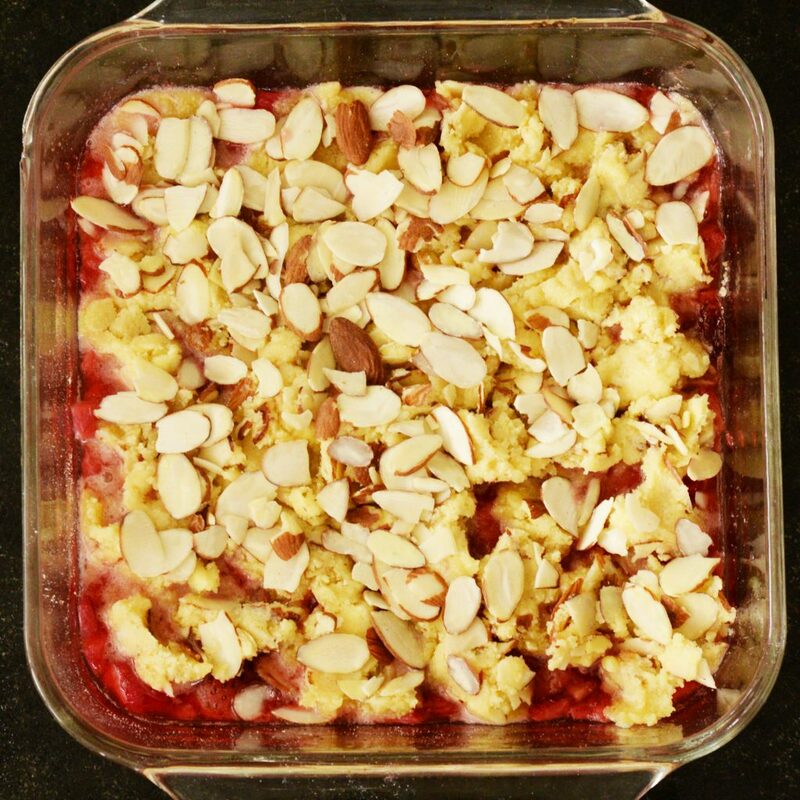 The recipe for Low-Carb Strawberry Rhubarb Crisp boast lots of fruit flavor and a tasty almond topping. This healthy version of an old favorite is gluten-free and grain. There is no added sugar making this dessert suitable for most diabetics, and those on low-carb, keto, or Atkins diets. 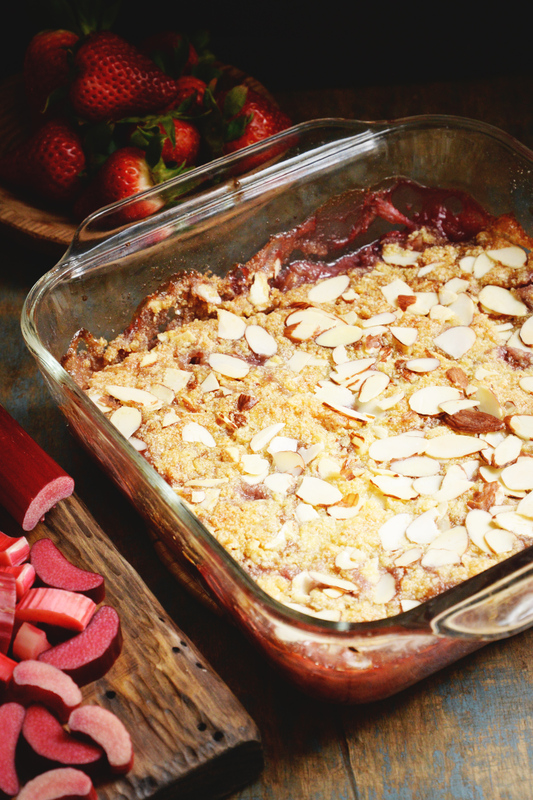 This recipe for Low-Carb Strawberry Rhubarb Crisp boasts a sweetened combination of fresh strawberries and rhubarb thickened and topped with a crumble made with buttery, almond goodness. While traditional crisps use starches to add body and thicken the fruit component, starch adds to the carbohydrate load. 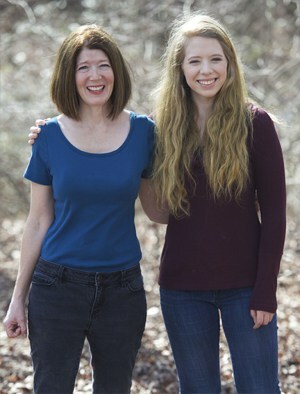 Because of this, I used some alternative, low-carb thickeners in this recipe. The thickeners I’ve used in this recipe include both xanthan gum and glucomannan. Both added an appropriate amount of body to the strawberries and rhubarb and neither added any noticeable flavor. Use whichever you have on hand. While crisps sometimes have spices like cinnamon and nutmeg added to the topping, I felt like these flavors competed too much with the fruit in this crisp. 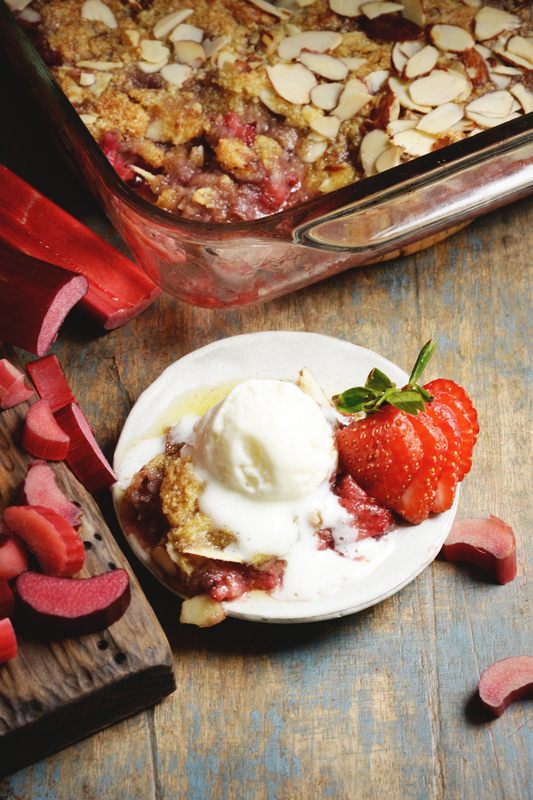 While these spices work very well with apple crisp, when I tried them with this crisp, they seemed to compete and didn’t let that lighter, fresh flavors of the strawberries and rhubarb come through. Because I felt the spices took away from the spring and summer nature of this crisp, I decided to focus on keeping the topping buttery and crunchy. The almonds add a nuttiness that works well with the lighter fruit, without overwhelming the flavors. 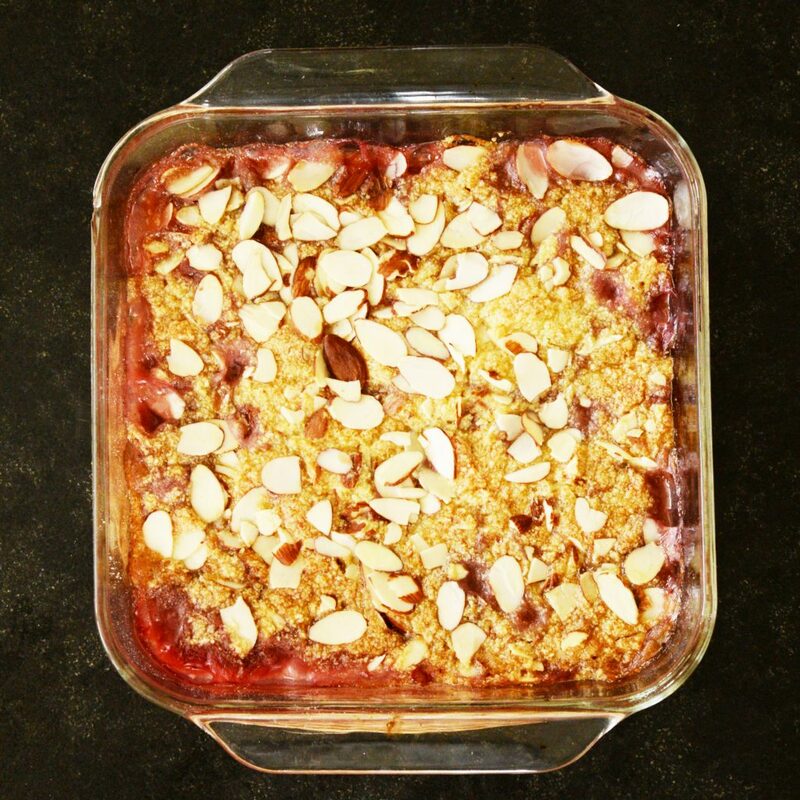 This recipe was inspired by a recipe for berry crisp in The Gluten-Free Almond Flour Cookbook. While my recipe is completely different, it got me thinking about crisps and crumbles and that they were more versatile than the apple crisp I knew when I was a kid. 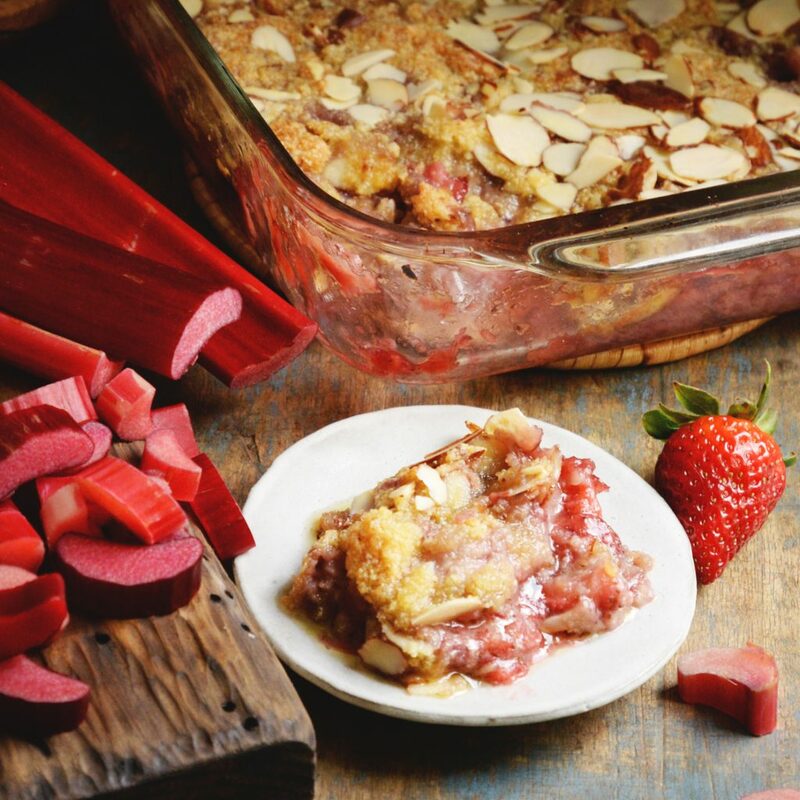 I’ve been craving strawberries and rhubarb, so I decided to use this combination and create a healthy version of a crisp. I started creating this recipe by basing it off of my recipe for blueberry cobbler for the fruit portion and winging it for the topping. Rhubarb is commonly used in desserts, but can be used in savory dishes as well. The stalks look like a little bit like celery, but the two plants are not related. 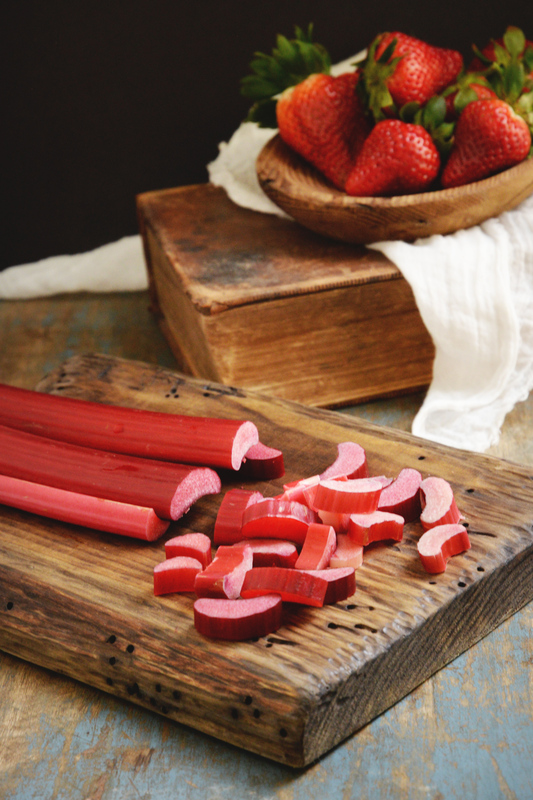 Instead of being green, rhubarb stalks tend to be pink in color. They can vary from having a few pink streaks, to being entirely pink throughout. Rhubarb is a perennial plant, so if you’re lucky enough to have a patch, it comes back year after year. The roots of the plant are used in herbal medicine, the stalks of culinary rhubarb are used in cooking, but watch out for those dark green leaves! The leaves contain large amounts of oxalic acid, which make them poisonous. Rhubarb stalks have a crisp texture and sour flavor. While they can be used raw, the stalks are often cooked with sugar to create some sweet-tart dessert goodness. 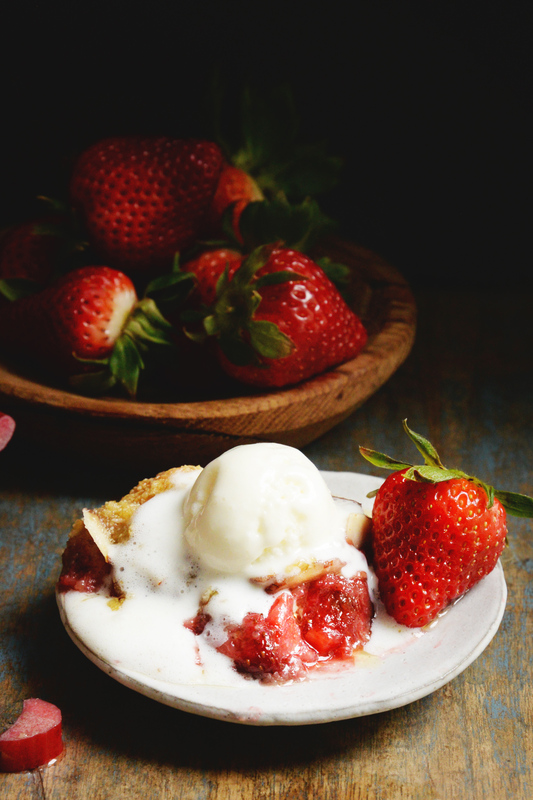 Often rhubarb is combined with strawberries since the two flavors together create a perfect marriage. 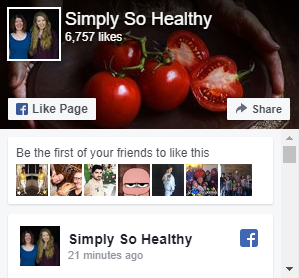 The combination makes delicious pies, cakes, crumbles, and crisps. Rhubarb can also be used in savory dishes. For example, I use it in a barbecue sauces in my recipe for Strawberry Rhubarb Barbecued Chicken Wings. While rhubarb is often used in desserts as if it were a fruit, it’s actually a vegetable. Its vegetable status makes it a perfect fruit substitute for those of us on a low carb diet, as it is much lower in carbohydrates than most fruits. Eating rhubarb makes eating vegetables for dessert something you’ll want to do. 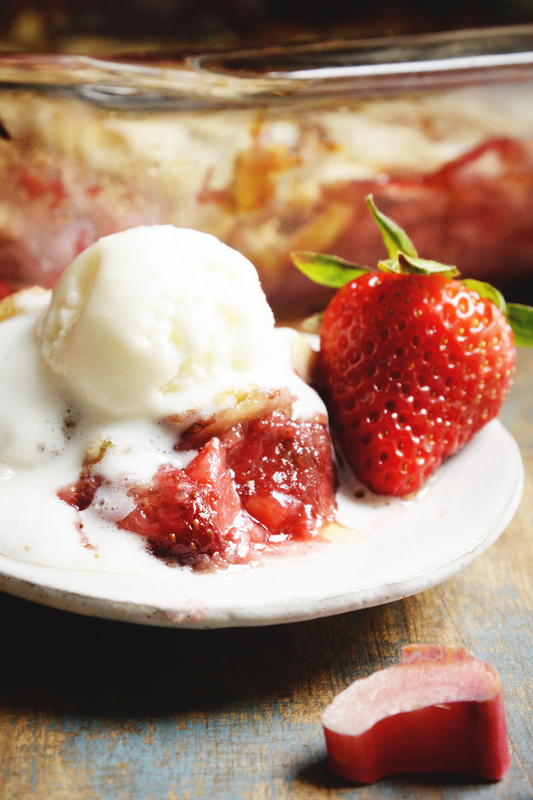 I love eating this low-carb strawberry rhubarb crisp warm with low-carb vanilla ice-cream. Whipped cream also tops it off nicely. I confess, though, that I ate all of the leftovers straight from the fridge. That sweet-tart flavor really comes through when the crisp was cold. Enjoy! 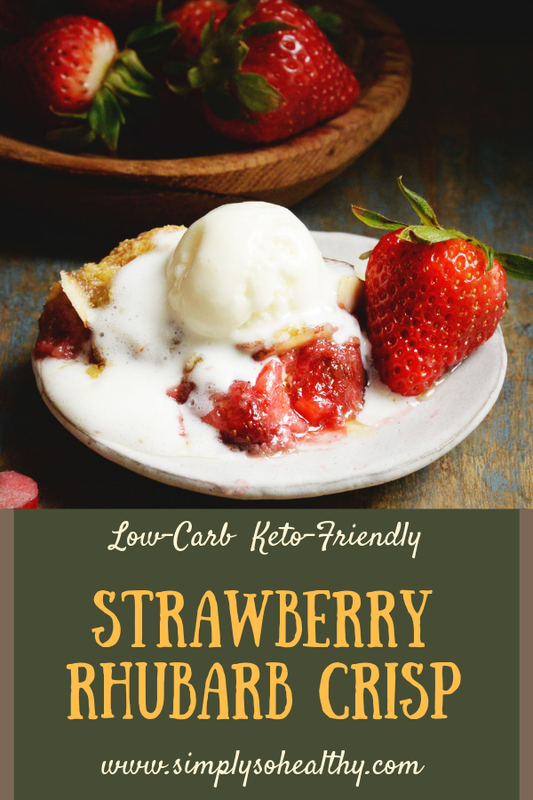 This Low-Carb Strawberry Rhubarb Crisp recipe is delicious dessert suitable for those on low-carb, diabetic, gluten-free, sugar-free, keto, or Atkins diets. Preheat oven to 375º Fahrenheit. 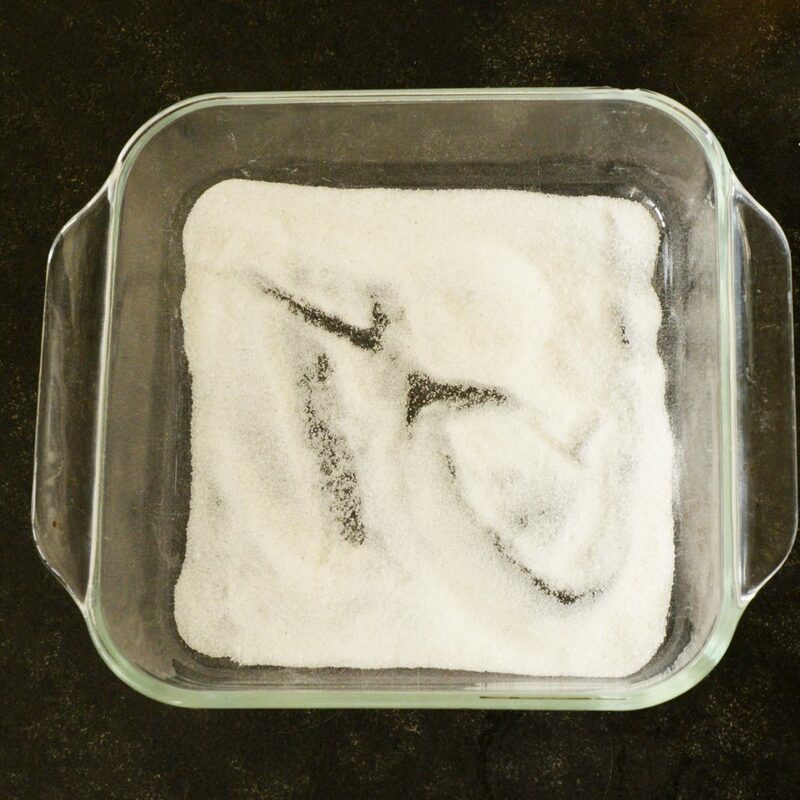 Whisk the sweetener, glucomannan, and sea salt together in an 8" X 8" baking dish. 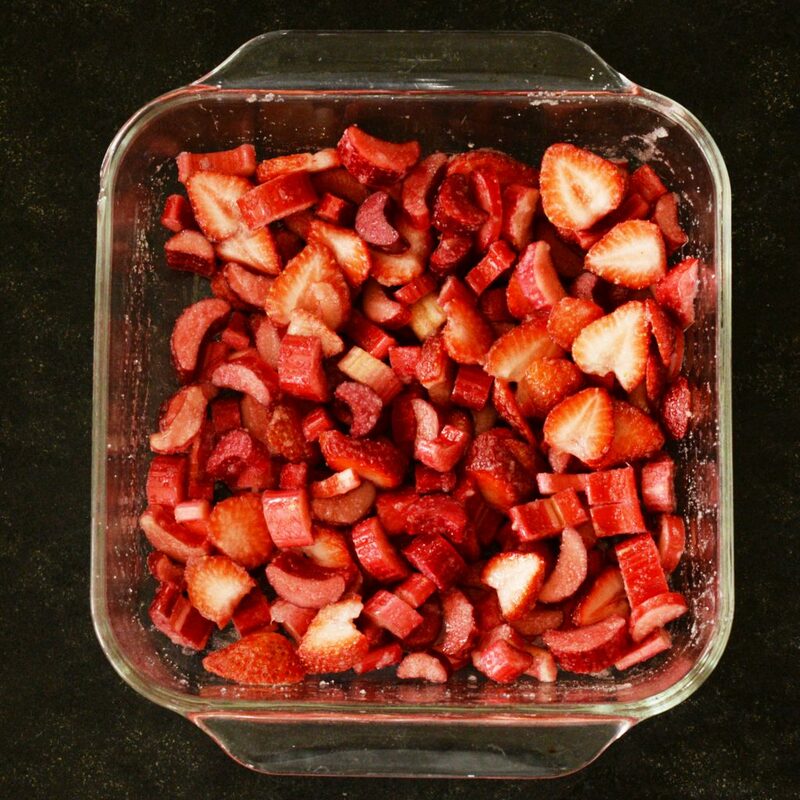 Stir in the strawberries, rhubarb, and lemon juice. Bake in the preheated oven for about 30 minutes, or until the strawberries and rhubarb begin to get tender. While the strawberries and rhubarb are baking, make the topping. 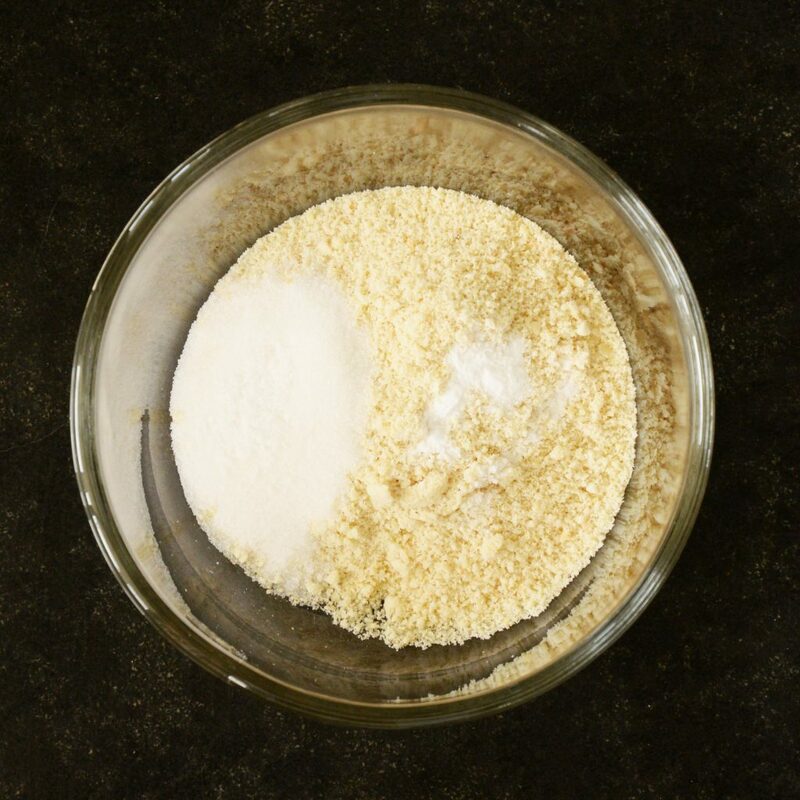 In a medium to large mixing bowl, whisk together the almond flour, sweetener, baking soda and sea salt. 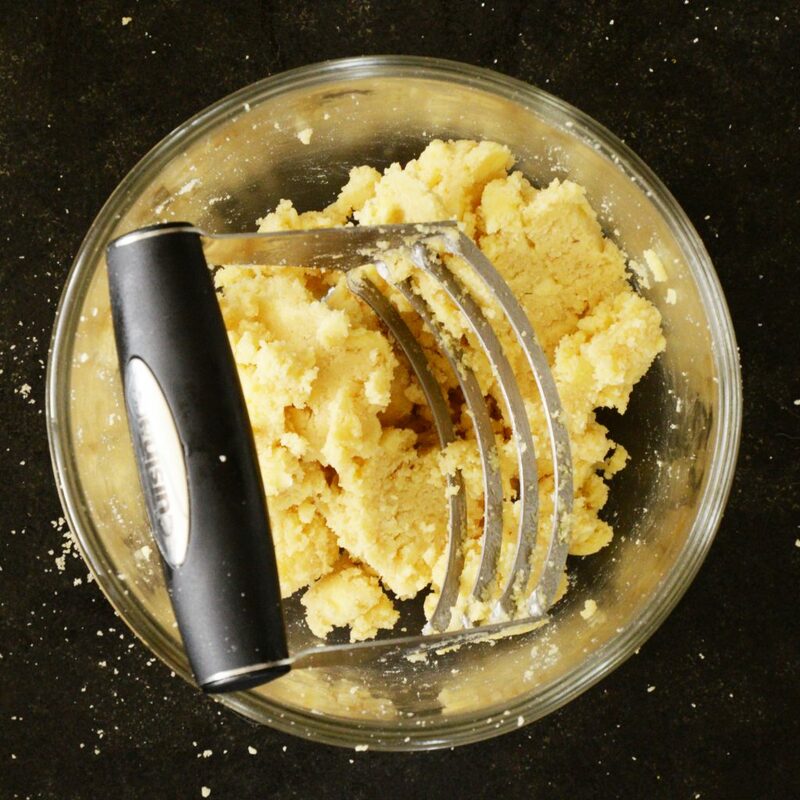 Cut the chunks of butter into the dry ingredients using a pastry blender. (You could also melt the butter and stir it in if you don't have a pastry blender.) Stir in 1/2 cup of the almonds. When the strawberries and rhubarb have finished baking, remove them from the oven. Using your hands, crumble the topping mixture over the top to cover it evenly. Smooth the topping gently with the back of a spoon, if desired. Sprinkle the remaining 1/4 cup of the almonds on top. Bake for about 18-20 minutes longer or until top is golden brown. Divide into 9 servings. This dessert will need to be scooped out with a spoon or spatula as you would a cobbler. Serving size: 1/9th of the crisp. Per serving: 4 grams net carbs.